Government statisticians collect a large amount of data. They don’t make it easy to find. But, a little digging yields important information. The chart below uses data from the Bureau of Labor Statistics. I combined information on the number of job openings with the number of unemployed persons in an industry. Right now, there are more openings than people to fill them. In the chart, 115% means there are 1.15 job openings for each unemployed person. 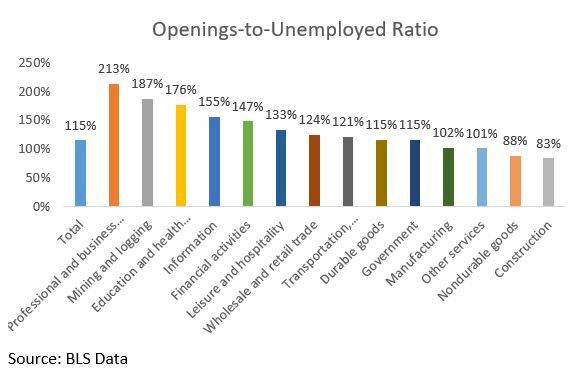 In mining and logging, there are 1.87 job openings for each unemployed. This is the fifth month in a row with more job openings than unemployed. Of course, this is a complex problem. Specialized and dangerous jobs have the largest gap. There aren’t enough unemployed cardiologists, for example, to fill advertised jobs. There aren’t enough skilled loggers to fill jobs safely. There are only two industries with more unemployed than jobs. One is non-durable goods manufacturing. The other is construction. Non-durable goods include food manufacturing. This includes jobs in bakeries, slaughter houses and meat packing plants. These industries have just 88 openings for every 100 unemployed people. In construction, there are just 83 openings per 100 unemployed. These are hard, physically demanding jobs. They often pay below-average wages. They’re the jobs media reports say can’t be easily filled. Yet, there are many individuals vying for those jobs. It’s a sign that Americans are still hardworking. But, the economy isn’t providing this kind of job anymore. The economy is producing jobs that require specialized skills. It’s not producing jobs that are easily filled. This is a sign inflation is on the horizon. Employers will eventually increase wages to fill these vacancies. To entice employees to switch jobs, employers will need to offer salary increases that are higher than the rate of inflation. It’s also a sign income inequality will grow. Higher salary increases for professional jobs will increase the growing gaps in the economy. As wages rise at the top, employers will try to pay less for unskilled labor and low-wage workers will struggle to find work when the economy slows. Overall, it’s a bad sign for the economy. And, we will see how bad when the next recession hits. Now, we’re just months from a recession. History tells us the recession will start next year. It doesn’t tell us how deep the recession will be. But, it will be deeper than average since the Federal Reserve is powerless to stop the inflation spiral that will develop as wages increase.